Traveling magazine of UK Conde Nast Traveler ranked Long Bien Market (Hanoi) the 3rd among 7 the world’s best markets. Long Bien is one of the most important markets in Red River Delta region and the 2nd biggest markets in Hanoi (after Dong Xuan Market). It gathers almost all products from many southern provinces, especially raw food such as vegetable, meat, egg, etc. The market is held in all day and night and the most crowded the very early morning, from 2am to 4am. The products will be provided to other smaller markets in Hanoi. The best time to visit Long Bien market is in the early morning, when the sun hasn’t come out yet. 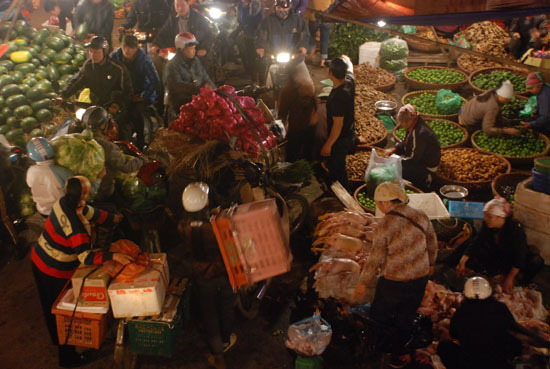 You will have chance to experience the bustle, vibration and crowd of a big market in Hanoi. It has mass of activities that you cannot imagine: buying, selling, driving truck full of products, motorbike riders waiving down everywhere, bargaining, counting money, loading boxes of products, etc. It is a great way to discover the normal life of Hanoi and southern residents and feel the hard work they are doing in the bed time. Long Bien market is not a really must-see destination when you travel Hanoi, but getting up early in the morning and explore the life before sunrise is a completely different experience and it is interesting too.